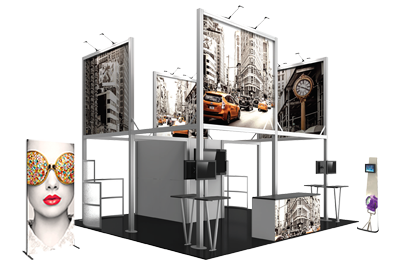 The Formulate® 10ft tower 02 combines the latest developments in fabric printed technology with aluminum tube frames to add dimension, decor and sculpture to any event, stage set, trade show booth or interior space. Formulate towers accommodate internal LED lighting. Accent LED light not included, but can be incorporated to add glow within the structures.